In a rapidly advancing technological age we have to ask the hard questions about what impact electronics, such as cell phones, have on our lives. A short film is the perfect medium to do this, and as a filmmaker, I created a short film that doesn't answer any of these questions! And thus is the beauty of a comedic short. I created Give it Time in the fall of 2007 for the Sasktel Cell-ebrities Online (Cell phone related) competition. My idea had been a work in progress since the summer that year, but it wasn't until November that things actually got underway. My goal for the project was to create something that seemed stylistically different than the other videos I'd been watching on the site, and most importantly, something that folks would watch more than once. The intial round of the contest where anyone could upload a video had started in the summer, and it took me until November to make my vid because I wasn't even sure I had a chance. Sasktel is the provincial phone company of Saskatchewan and the contest was only for residents of the province. I was living there at the time going to the University of Regina, but technically, I was still a permanent resident of Alberta. A semester of work, and doubt if I'd even be eligible to win any of the prize money had me second guessing whether it was worth the effort to make a film specifically for the contest. Despite this, I'd been thinking about what kind of movie I would make if I were to enter, largely because my friend Tyler had been quite interested in the contest and had uploaded his film Gilligan. I talked myself into making a short by reasoning that even if I wasn't eligible to win, it would still be something if they said they wanted to accept my film but couldn't because of technicalities like my address. With so much time to think about and refine an idea, it seemed like a waste not to try. So late in November, living in the dorms I went down to the math lounge at 2 in the morning to shoot my film. I knew exactly what I wanted to do, only needed a few camera setups, and knew that the strength of my project would come from the clues I gave in my dialogue and how I cut the video in post production. Fast forward to early January 2008, and Give it Time and the other short film I made for the contest just weeks later, The Gizmo Tree, had both been selected as Top 10 finalists in the contest. Feeling that the Gizmo Tree was a more mainstream approach, I chose to promote that film in the voting round leaving Give it Time on the sidelines. When all that was said and done, I was left feeling that Give it Time hadn't really had a chance because the whole contest suddenly became about my other short. I still felt that I should do something with the project because so many, including the judges at Sasktel, told me how much they enjoyed the twist in my film, and how it got better with each viewing when you were in on the joke. It was around the same time that I began thinking about submitting something to the Youngcuts Festival in Montreal. I made a few minor changes to Give it Time, including new credits, sfx and a music track and sent it off. Fast forward a few months again, Give it Time had been accepted at the 2008 Youngcuts International Film Fest and was a nominee for Best Short Short (film under 3 minutes). All and all I got everything I wanted from the project. 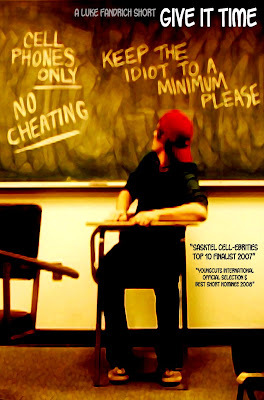 It was a great experience being the only person in the Cell-ebrities contest to have two films in the finals, and getting to weigh the feedback between those who thought Gizmo Tree was better and those who thought Give it Time was. Youngcuts gave the project legs of its own, and for the sake of my portfolio, distinguished it with a notable credit outside of Cell-ebrities. Even my current employer mentioned to me that it was my editing in Give it Time that sparked her interest in offering me the job. It always amazes me how connected things actually are in terms of the benefits and positive word of mouth that occurs when I'm on a promotion kick. A lot of it I never hear until well after the fact, but it just goes to show that even without winning on this particular project, I was still able to improve on my portfolio, get people talking about my work, and motivate myself. The evolution and result of making Give it Time has proven to be a signifcantly positive experience. My point behind all of this, is that the payoff came simply from talking myself into trying, even when it seemed like I might not have a chance at the reward. It's a lesson I hope I continue to follow. "Keep the idiot to a minimum?" Yes good sir, this is the Luke Fandrich quote of the year. Make T-shirts with the quote, sell T-shirts with the quote, and make billions. Being a financial and money-making expert, I suggest you take this thuper therially . . .